Looking at the clear sky, you saw a feathery cloud extending all over the atmosphere and wonder; what type of cloud is this? In all probability, you are gazing at cirrus clouds. These clouds are closely associated to fair weather, but did you know that they also indicate a forthcoming weather condition? Read on to learn more. Cirrus clouds are first indicators of an upcoming weather system. However, it does not produce rainfall because it is largely made of ice crystals because the temperature at high elevation is below freezing point. Cirrus clouds are the most delicate looking clouds and also a strong indication of atmospheric humidity. At What Altitude is Cirrus Cloud Found? Cirrus cloud belongs to high-level clouds, which means it is found above 20,000 feet or 6,000 meters from the ground. At this atmospheric level, temperatures are very low that is why moisture freezes into ice crystals instead of forming into water droplets. Although it is closely associated as fair weather cloud, if they are large enough, cirrus clouds may signify upcoming frontal system. It may also indicate a decayed thunderstorm. Cirrus is a Latin word which means “wisp of hair” aptly describing the high-level cloud formations stretching all over the sky in subtle strands. Cirrus clouds appear like fibrous and thread-like clouds closely resembling hair curls. They are thin and transparent in white color due to their ice crystals composition. Patterns of cirrus clouds largely differ depending on the inconsistent wind flow in vertical and horizontal directions. Normally, these clouds are the first cloud warning about an upcoming warm front. A cirrus cloud is formed from atmospheric turbulence resulting from strong vertical alteration of wind direction. This happens when a weather frontal system is advancing and stable air rises. Cirrus clouds also develop when water vapor experiences deposition and form ice crystals. Blowing out of ice crystals from cumulonimbus clouds or other high-reaching clouds can lead to cirrus cloud formation as well. Cirrus clouds are further classified into species and varieties. Let’s consider each one of them closely. This cloud is characterized by long parallel bands or lines of clouds radiating from the horizon. Cirrus radiatus is the less common type of cirrus cloud but is very dramatic. Cirrus Fibratus cloud appears in thin threads or fibers. They sometimes develop from aircraft contrails and stay for quite some time. This type of cirrus cloud has distinctive hooked-shaped threads or fibers. It closely resembles the tail of a horse as a result of strong winds underneath the cloud level where ice crystals are formed. Cirrus spissatus is characterized by dense cirrus clouds appearing like patches that cover large portions of the sky. It’s a strong indication of incoming warm frontal weather system in the next 48 hours. From the Latin word castellanus, meaning “small towers”, cirrus castellanus exhibits tower-like formations. Cirrus floccus cloud appears in worn-out, flaked, and puffy patches. This cloud is characterized by entwined or twisted patches. 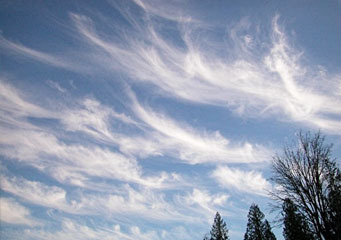 When you see clouds resembling fish bones or ribs, you are looking at cirrus vertebratus. This cloud is distinguished by multiple layers of cirrus clouds on top of each other. Cirrus mamma clouds have sac-like extensions at the underside. These clouds are common worldwide especially during summertime. Even so, they are also visible during winter time. Whenever you see cirrus clouds in the sky, chances of rain should be expected within a couple of days. But for the mean time, you can enjoy the outdoors with the fair weather.